Wing Park provided plenty of activities for the athletic-types, who were interested in swimming, tennis or golf. 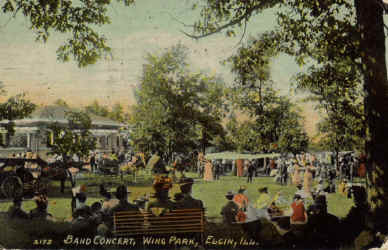 However, a part of William Wing's legacy also provided a place for people to gather and to hear a concert in the park. It was possible, on a warm summer night, to spend a few hours hearing The Elgin National Watch Company Band or any of a number of others that would perform in the in the park. Throughout the 1920's, serious efforts were being made by many large companies like The Elgin National Watch Company to reduce the employees number of hours worked per day from 12 to 10, and then from 10 to 8. It was also around that time that work weeks were shortened from 6 days a week to 5. This gave the citizens of Elgin additional time to enjoy many of Elgin's natural treasures.